The Furn Bistro and Bakery remains a good place for dinner but there is definitely one issue with it – the speed of the service, respectively how long it takes the kitchen to prepare the food. Luckily, it is worth waiting as the dishes are actually quite tasty. 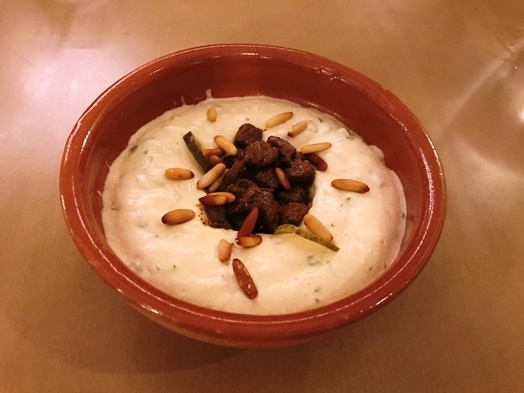 The “Humus Bil Lahme (lamb meat)” (3.200 BHD) is absolutely great and a nice change to the regular hummus you get everywhere. 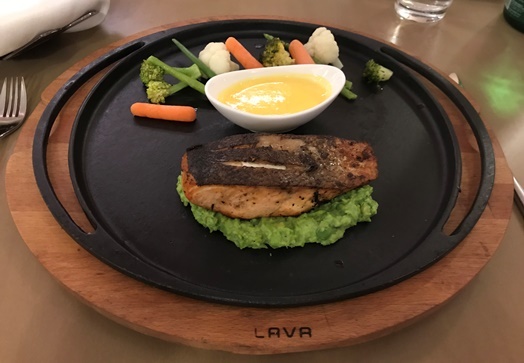 The “grilled salmon (green peas, saffron sauce)” (9.500 BHD) on the other hand is a bit of a rip-off. I mean, the piece is tiny and rather dry and if you check how many vegetables there are, then it is definitely overpriced. I must say that the green peas basis for the salmon is super tasty though. The place itself is definitely nice – nothing spectacular but nice to sit down and definitely more atmospheric than most restaurants in the mall. When you come, just make sure you bring some time as we were waiting a solid 45 minutes until the dishes finally arrived. And while waiting for the hummus was fine, it wasn’t worth it for the salmon. 1 Comment on "When service is ridiculously slow: Furn Bistro & Bakery @ The Westin Bahrain City Centre (3. December 2017)"
I am sorry to hear that you had a less than satisfactory guest experience whilst dining with us and thank you for your feedback; I have already communicated it to the team. Please do contact me so that we can further discuss the points you have highlighted.